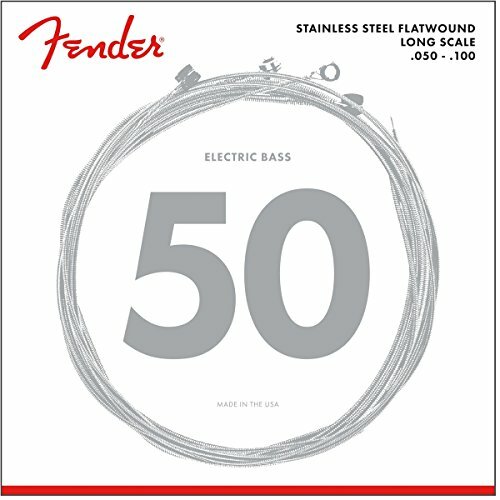 Fender stainless steel flatwound 9050’s are anexcellent choice for jazz, country, r & b and reggae.the first electric basses were made by fender, andthose basses came with flatwound strings. today, manyplayers use stainless steel flatwound 9050’s to add adifferent character to their tonal palette. from smoky jazzclubs to r&b venues, from reggae parties to countrymusic halls, 9050’s have you covered.by the way, the stainless steel construction also givesyou longer life, and the flatwound construction reducesfinger noise. Fender stainless steel flatwound 9050's are anexcellent choice for jazz, country, r & b and reggae. The first electric basses were made byFender, andthose basses came with flatwound strings. Today, manyplayers use stainless steel flatwound 9050's to add adifferent character to their tonal palette. From smoky jazzclubs to r&b venues, from reggae parties to countrymusic halls, 9050's have you covered. By the way, the stainless steel construction also givesyou longer life, and the flatwound construction reducesfinger noise.